The other night my family and I went to our first NFL game, a pre-season matchup between the Tennessee Titans and the Minnesota Vikings. Dear friends of ours had tickets and invited us to come along with them. Three things really stuck out to me about our experience. For starters, it was pouring down rain for the entire first half of the game. I am not used to competition continuing in the rain. I am used to hiding out in a race car hauler with others, staring at the radar on our phones pretending we are meteorologists. It is just an unusual, uncomfortable prospect for us racetrack folk to watch a sport continue in the rain. Second, football is just way too quiet of a sport. We could actually talk to each other without yelling; it was really odd. There was a 4-wheeler that sat quietly in the corner of the field that I wish they had fired up for ambience, but I digress. Lastly, Mr. Megaphone was greeting game goers as we arrived at LP Field. Mr. Megaphone proudly stood in the corner near gate 3 with a small amplifier hanging around his waist proclaiming the judgment of God. We listened as he shouted that Michael W Smith was a demon possessed devil worshiper (and that those that listen to him were going to hell along with him). We read his shirt, which boldly proclaimed, “Ask me why you deserve hell.” We studied his sign as he seemingly taunted folks with his words as they walked by, and then moved along. It was difficult to watch Mr. Megaphone. I wasn’t uncomfortable because Mr. Megaphone was out there talking to people, we should all have a spine to stand and speak for truth. 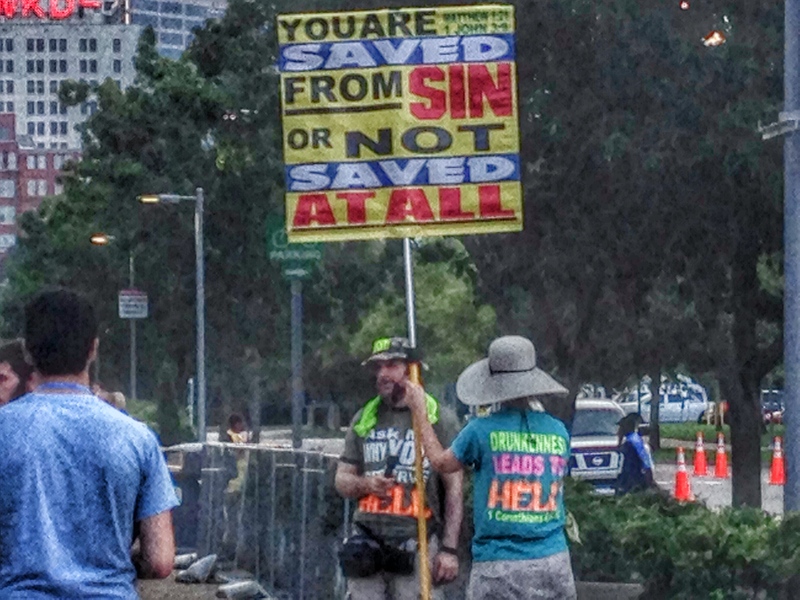 I wasn’t bothered by his use of the words sin, hell and judgment because they are all real things. I was heartbroken by the skewed brand of religion he proclaimed. His religion tells us what we have to do to earn God’s love. That is not the Gospel I know. The Gospel tells us what we get to do as a response to God’s love. The picture Mr. Megaphone painted was that all we had to do to avoid hell was to stop sinning. I can easily use the prospect of hell to scare someone into ‘doing the right things’, but by doing so I have only treated a symptom and done nothing to cure the disease. It is a rejection of Jesus that leads us to hell. Sin is just the result of that rejection; it is the violation of that ideal relationship between God and us. So if our approach is to alarm people into acting differently to save themselves from hell then we are doing nothing to offer life. If we focus on the symptom (sin) and not the problem itself (relationship) then the person is no better off than they were before. On the other hand we can be, as Jesus said, salt and light, shining out to all that they would see Him through it. We can love others as we love ourselves and introduce them to a relationship with Jesus. Hopefully as a response to love, they begin to love God and others in return. Does that mean sin is unimportant? Quite the contrary, sin is a great indicator of our relationship with, and love for, Jesus. If we truly love Him, we would be doing what pleases Him. If we love our spouse, we honor them. If we aren’t honoring them, chances are we don’t love them. If sin is present then we need to reevaluate our relationship with Him because it is the visible indicator that we are not loving Jesus as we should. Sin is the byproduct of a broken relationship. As we restore ourselves in true relationship with Jesus we want to please Him…going and sinning no more. We can’t be good enough to experience Heaven; we just have to be in love enough.